Performing arts centre, built 2002-2004 by Paul Andreu. Opened 31 Dec 2004 with a concert. The complex contains several halls: Concert Hall (1953 seats), Opera Hall (1015 seats), Performance Hall (333 seats), and an exhibition hall. Reverse Text: "Shanghai Oriental Arts Center. It occupies a land area of 23350 sq. m. and has a floor space of 40000 sq. 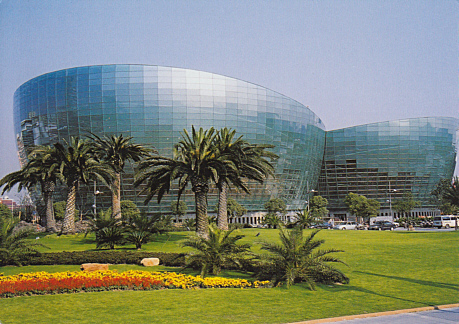 m. It is a comprehensive type of art center highlighted by a concert hall."